Prof. Geoffrey Ozin discusses our growing gigatonne CO2 challenge, and how we must now work together to solve it. To appreciate the magnitude of the roughly 30 Gigatonnes of anthropogenic CO2 emissions that humans generate annually from the combustion of fossil fuels, it is useful to illustrate what 1 tonne of CO2 actually looks like physically, in relation to a well-known object. 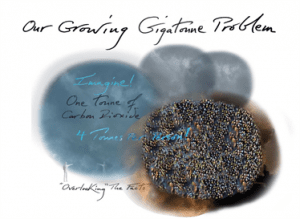 The idea is to obtain a more realistic and striking sense of scale of “Our Gigatonne CO2 Challenge”, rather than trying to visualize the magnitude of the number itself taken in isolation. To help grasp this reality, Figure 1 shows a picture of a 10 meter diameter sphere of CO2, which weighs 1 tonne in relation to a London double-decker bus. This graphic illustration gives meaning to mass in the form of volume. By relating the problem to familiar objects, a more meaningful and comprehensive picture forms, which gives us a better feel for the masses of CO2 produced annually from the use of fossil fuels. Figure 1. 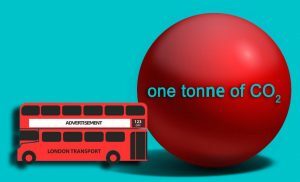 Your Annual CO2 Footprint – Roughly Twenty Times Bigger Volume than a London Double-Decker Bus. Graphic illustration courtesy of Chenxi Qian. This image dramatically depicts what I call “Our Growing Gigatonne CO2 Challenge” that we must now work together to solve forever. This urgent collaborative work is a key part of this challenge to radically reduce greenhouse gas-induced climate change. More to the point: a disturbing picture emerges that may prompt people to realize that we’re all contributing to the growth of this Gigatonne CO2 problem, as this evocative image and others in this article intimate. Just imagine 30B = 30,000,000,000 of these 1 tonne CO2 spheres being injected into our atmosphere every year from the combustion of fossil fuel. With the current population of the world at 7.4B, this today amounts to around 4 tonnes per person annually. I find it disquieting that currently there is no obvious technology-policy evidence we know how to reduce the global CO2 emission rate and solve the looming global warming and climate change problems fast enough. Yet, it is now a global priority that we find ways and means to cut these emissions in half to avoid the inconvenient consequences of global warming. Tackling together “Our Growing Gigatonne CO2 Challenge” entails not only discovering and implementing different approaches for the mitigation and reduction of CO2 emissions to meet greenhouse gas targets as defined in the Paris Climate Agreement. It also involves utilizing CO2 as a feedstock for making value-added chemicals, materials and fuels as fast as possible and at a scale, efficiency and cost that can stabilize the concentration of CO2 in our atmosphere. In the context of the larger perspective of 21st century solutions to the global energy and environment challenges that we face, one has to breakdown the problem into short (2030), medium (2050) and long term (2100) approaches to enable the transition from a non-sustainable fossil energy system to a sustainable renewable one. Remember that today’s fossil intensive global energy infrastructure and globalized economy required trillions of dollars and over a century to create from scratch. An energy transition to a carbon neutral sustainable world will take time and will be expensive with challenging trade-offs with economic growth. This transition will only be possible if the political and business leaders of the major greenhouse gas emitting nations believe in climate change and are prepared to invest in renewable energy technologies. Thinking about the near term strategy to enable this energy transition, the consensus is that improvements in energy efficiency for industrial processes, building construction, land, sea and air transportation, information technology, use of natural gas and conversion to electric powered vehicles, together will serve to gradually replace coal and reduce the use of oil and natural gas. In the mid-term, the increased implementation of solar and wind power, fuels cells, biomass, biofuels and biogas, waste heat recovery and smart grids, together with CO2 capture, storage and utilization, will further diminish the use of coal, oil and natural gas by increasing the conversion of CO2 to value-added chemicals, materials and fuels. Together these approaches should enable control of atmospheric CO2 emissions at a level that maintains average global temperatures below the Paris Agreement target of 1.5-2.0°C by 2030. Fast, practical, large-scale and economically sensible mid-term approaches to CO2 utilization will most likely be based upon the use of biomass, electrocatalysis and heterogeneous catalysis for making chemicals and fuels from CO2, which will be supplemented by mineralization of CO2 to inorganic carbonates, for permanent storage of CO2 and manufacture of construction materials, like concrete and cement. Long term solutions to our energy and environment challenges will include the use of solar power for generating H2 from H2O and using the H2 for converting CO2 into chemicals and fuels, grid-scale battery storage of renewable electricity, superconducting electricity transmission and maybe even the long-awaited “holy-grail” breakthrough of nuclear fusion energy. A measure of the success of all of these processes will be the CO2 footprint. It would not be smart to develop a biological or abiological CO2 conversion process that ends up adding more CO2 to the atmosphere somewhere else. For example, the use of grid electricity does not come for free in terms of CO2. A trivial mass balance can be applied to describe the user-friendliness of a CO2 conversion process: the amount of CO2 emissions associated with the energy consumed is subtracted from the amount of CO2 converted in the process and should be neutral or negative. Figure 2 All the Earth’s CO2, Natural (blue) and Anthropogenic (red) in a Box; Graphic illustration courtesy of Chenxi Qian. 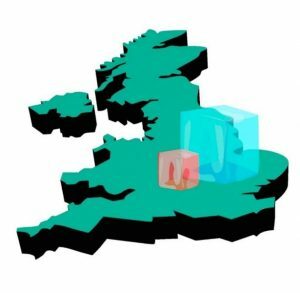 Along the lines of Figure 1 is another powerful image shown in Figure 2 that depicts in strikingly visual scientific and artistic form, a cube that contains all the CO2 in the earth’s atmosphere lumped into two domains. This cube is about 120 km on an edge and at a pressure and temperature equivalent to that at sea-level contains roughly 3 trillion tonnes of CO2 that constitutes the troposphere. Natural CO2 is represented by the blue segment of the cube while the red segment is anthropogenic CO2 created by the use of fossil fuels since the industrial revolution. The former is sufficient to maintain life on Earth. Continuing to increase the latter, by business as usual consumption of fossil fuels, has the potential to tip the balance between life and extinction on Earth. I have always been an optimistic scientist in my approach to problem solving but to be quite honest I am not sure whether we really know how to solve our Gigatonne CO2 problem fast enough to prevent average global temperatures rising above the perceived threshold value of 1.5-2.0°C. Climate change is certainly the greatest challenge that our global family has had to face in the history of humanity. Perhaps it will be climate economics that comes to our rescue as climate change gains momentum as a global investment enterprise because of the impact transitioning from non-renewable to renewable forms of energy will have on investors’ portfolios. Clearly, we must all now shoulder the Herculean responsibilities of caring for our Earth with the same degree of concern as we care for ourselves and our collective future. The big question is, can “We” rise to this Herculean challenge and can “We” do it in time? Figure 3. We’re all “Overlooking the Facts”. Graphic illustration courtesy of Todd Siler and Geoffrey Ozin, www.artnanoinnovations.com. That’s what’s implied by this double-entendre, “Overlooking The Facts.” In trying to “look over” the facts on climate change – in trying to evaluate the potential impact of The Problem – most people don’t see ourselves contributing to it by releasing 4 tonnes of CO2 every year. That number is massive when you consider the mass of humankind doing that collectively! To press this point and “hyperbolize” it (create a visual hyperbole), I’ve overcrowded one of the spheres. That Metaphorm may strike you as a Malthusian image invoking Thomas Malthus’s “Essay on the Principle of Population” (1798), but it’s not. I’m suggesting that our global environment may “feel” like this image looks! Especially, when you consider it in the context of what you’ve described in an earlier opinion editorial concerning the trillion tons of methane that will be released from permafrost if we don’t make our numbers noted in the Paris Agreement. As you know so well, our perceptions define reality. If we perceive ourselves as not being part of “The Problem” or overlooking it rather than constantly looking over it and responding to it then we won’t “Grasp It” or do anything to significantly change what needs to be changed now.